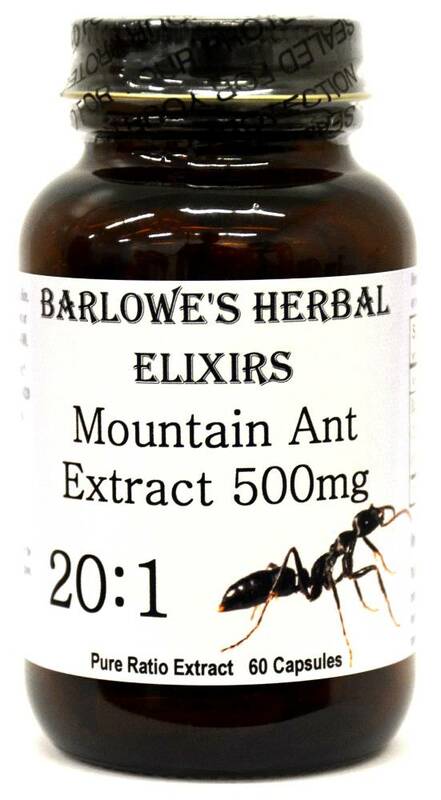 Barlowe's Herbal Elixirs proudly offers a hard-to-find 20:1 Mountain Ant (Polyrachis Vicina Roger) Extract. Mountain Ant Extract has been highly regarded in Traditional Chinese Medicine as a tonic and anti-aging "herb" for millenia. It increases vitality and may help increase libido in both men and women. Bottled in Glass! No Stearates! No Fillers! No Junk! 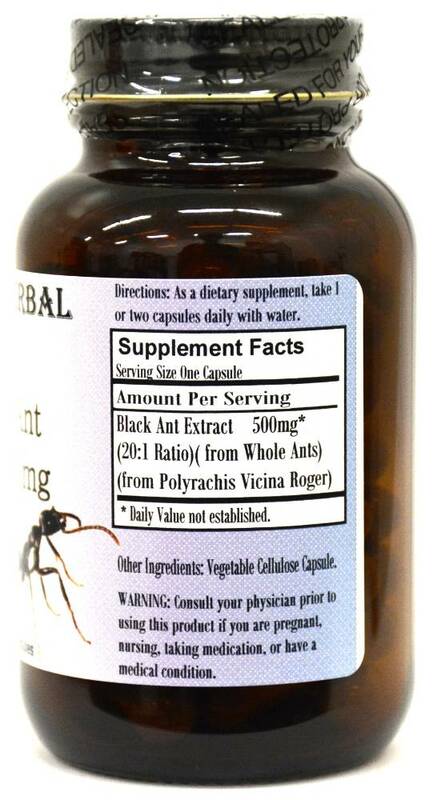 Barlowe's Herbal Elixirs proudly offers a hard-to-find 20:1 Mountain Ant (Polyrachis Vicina Roger) Extract. 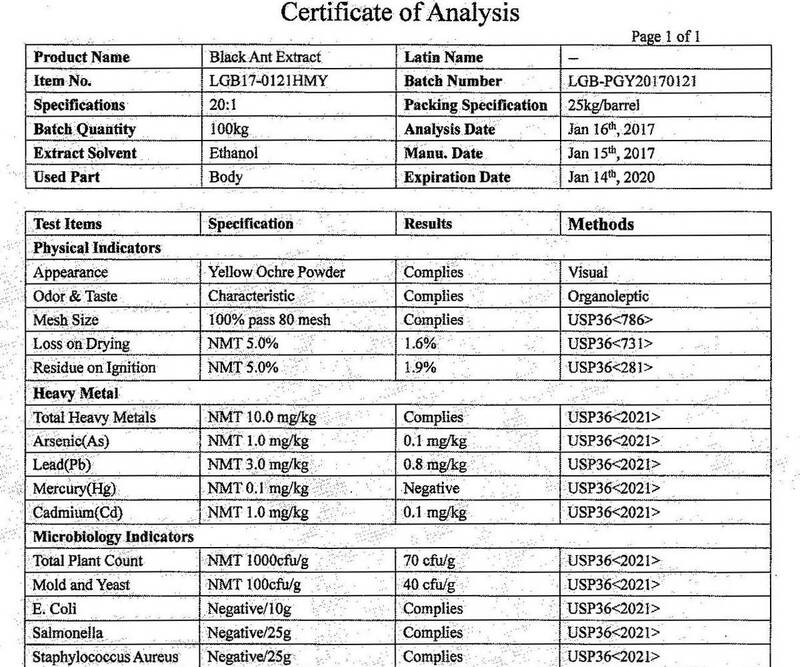 The Mountain Ant Certificate of Analysis (COA) of this particular batch is shown above. Mountain Ant Extract has been highly regarded in Traditional Chinese Medicine as a tonic and anti-aging "herb" for millenia. It increases vitality and may help increase libido in both men and women. This Extract is produced from wild ants using a water/ethanol extraction method. It is the most potent Mountain Ant Extract available anywhere. Bottled in Glass! No Stearates! No Fillers! No Junk! ***These vegetable-derived capsules (Vegan, Kosher and Halal certified) are filled on slow speed equipment and only pure, unadulterated herbal extract is contained in the capsules. There are no magnesium stearates, fillers, gelatin, silicates, gluten, corn, wheat, rice, yeast, starch, titanium dioxide, artificial colors, artificial flavors or preservatives. Capsules produced with high speed equipment in herbal and dietary supplement "factories" generally contain several other ingredients, including powdered lubricants called STEARATES (which can greatly diminish an herb or supplement's absorption into the body). Check their labels! Barlowe also still bottles his products in glass as he believes chemical vapors can vent from plastic containers and contaminate the contents and that glass is better for the environment. Extracts of the Polyrachis Vicina Roger (Mountain Ant) are widely used as a tonic and to prolong life. It is used for many other reasons as well - to calm anxiety, improve digestion, and to promote sound sleep. It is one of the elite anti-aging "herbs" utilized in Traditional Chinese Medicine. It is extremely rich in zinc and Mountain Ant Extract is said to increase the amount of DNA and RNA in cells, which aids in rejuvenation of the body. It is mentioned in many ancient Chinese medical texts where it is said to be a potent libido herb for both men and women, and an excellent liver and kidney tonic. It is very popular in many Asian countries today, particularly in Hong Kong and Taiwan. Both sexes state that the usage of Ant Extract for even a short time increases libido. Caution: Mountain Ant Extract is generally safe, but it is potent and should be utilized with care. This product is for dietary use. If unexpected side-effects occur, discontinue use immediately! The above statements have not been evaluated by the Food and Drug Administration (FDA). This product is not intended to diagnose, treat, cure, or prevent any disease. Directions For Use: Take one or two capsules daily with water. For some people, dosage may need to be increased as results and usage amounts vary based on body type and weight.